Forbes calls it "The E-Mail Time Capsule," but it sounds more like sending a message in a bottle to yourself. It's very intriguing. What would you tell yourself 20 years from now? You can opt to send the email to yourself after 1, 3, 5, 10 or 20 years. But you have to do it now. The offer ends today, November 30. If you'd like to find out how it works, see "Building An E-Mail Time Capsule" by David M. Ewalt. This blog does not get as many comments as the more popular blogs, but I've gotten used to seeing a few once in a while. Well, I was beginning to wonder where all the comments went when I got an email from Ghee asking whether I had disabled comments. That led me to check HaloScan and found out that there were a LOT of comments awaiting moderation! I don't know how moderation got turned on, but I guess I might have done it unwittingly. Sorry to all those who were expecting a reply—or just wanted to see their comment "published." I've already approved the comments and will be replying in the next few days. Google's PageRank (PR) is one of the factors that determines the order in which results are displayed after a search is carried out. If, for example, the word "Filipina" is Googled, a site's PR contributes to the position of the link to the site when the results are shown. "The Anatomy of a Large-Scale Hypertextual Web Search Engine" by Sergey Brin and Lawrence Page - If you've wondered about the origins of Google's AdSense, scroll down to Appendix A. "The PageRank Citation Ranking: Bringing Order to the Web" (pdf) Larry Page, Sergey Brin, R. Motwani, T. Winograd - Table 1 on page 10 shows the Top 15 PRs in July 1996! It's been six months since I wrote "Yan ang Pinay." Others had already written about the negative image of the Filipina online before that, but it was this post that got singled out as having "launched" the movement, even though I was actually just one of many bloggers who wrote about "Yan ang Pinay" on that day. If you decide to link to the sites listed above, please make sure that the word "Filipina" appears in the link and not some other word. For other ways to improve the Filipina's online presence, please see the nine techniques enumerated at Fabulous Filipinas or check out all my other posts on the Filipina. For newer images that you can use, there is a Filipina digital painting by Joel Chua (via Jonas Diego) and Filipina buttons by Audienceone. If you would like to know more about the objectives of "Yan ang Pinay"—including what it is and what it isn't—please see "The Filipina and 'Yan ang Pinay'." Most blograrians, according to the Frappr map above, are in the United States or Europe. As of this writing, there are only 159 blograrians who have "mapped" themselves. It's very likely that there are more, but I don't think the distribution will change very much. 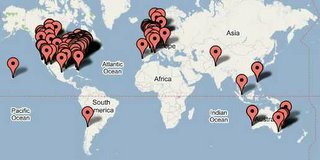 Click on the map to see who the few Asian blograrians are or add yourself. All you have to do is click on "Add Yourself," input the necessary information, click on "Not in the US?" and use "Manila, National Capital Region (Philippines)" for "City." Via Multifaceted Librarian. November 30—one week from today—is supposed to be an official holiday because Andres Bonifacio, one of the Philippines' national heroes, was born on that day. This year, the holiday will be on November 28, but all activities and celebrations connected with Bonifacio Day will still be observed on November 30 (see Proclamation No. 839). If you would like to read what has been written about Bonifacio by historians and other scholars, the best starting point online is Bonifacio Papers. It looks like a blog, of course, but it is really a collection of scholarly works on Bonifacio. Book excerpts, chapters and articles are reproduced in their entirety. The sidebar is practically a bibliography of Bonifacio's Works, what has been written about his Life, and other documents on Gregoria de Jesus and the Philippine Revolution. And then there's the section devoted to Glenn Anthony May's Inventing a Hero, which includes the "Introduction," the various Critiques of May's work, and May's Response. Thanks to "Great Web resources" by Queena Lee-Chua (Philippine Daily Inquirer, 20 November 2005), I found out about Astronomy.com.ph. 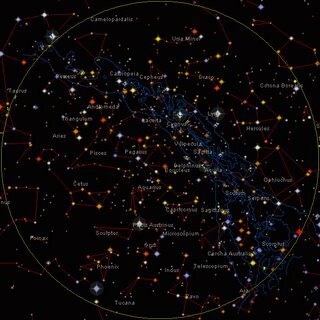 Click on the photo above to see what the stars in the sky look like from the Philippines right now. And if you are in the Philippines, you can actually print the map, go outside your house, and identify all the stars by name—assuming, of course, that it's night-time and it's a starry, starry night. The site is an ezine that features articles on astronomy written by and for starstruck fans. What makes it even better is that the writers don't assume that their readers are familiar with the subject. The following stories appeared over the weekend about a librarian who alleged that he was fired because of his sexual orientation. Marlon Lacsamana, the complainant, was also interviewed in "24 Oras," a Filipino-language newscast on 18 November 2005 (clicking on the link will lead to an index; look for "Nov. 18, 2005," and click on "Part 2" under "24 Oras"; it's the second story in the segment). Disclosure: Lacsamana was my classmate in library school. This post was going to be about an article on what McDonald's is doing for kids (see "Back to books, school and fun" by Irene C. Perez, Philippine Daily Inquirer, 20 November 2005). But when I looked at the McDonald's website, I learned that the Philippines is not among the countries listed on the website. My mind went on overdrive, of course. Could it be that McDonald's is ashamed to list the only country in the world where it's not the market leader? 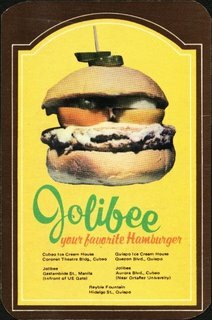 Check out "Jollibee stings McDonald's in Philippines" by Carlos H. Conde (International Herald Tribune, 31 May 2005) and "A busy bee in the hamburger hive" (The Economist, 28 February 2002). The title of DJ Yap's article says it all: "Fire destroys NVM Gonzalez literary works" (Philippine Daily Inquirer, 19 November 2005). NVM Gonzalez was proclaimed National Artist for Literature in 1997. (Note: The NCCA site says—incorrectly—that he was given the award in 1990.) One of the short stories he wrote was "Children of the Ash-Covered Loam." There is still, of course, the website devoted to Gonzalez and his works, but it is by no means complete. And definitely not the same as having the papers themselves. It is only now that I truly appreciate what I wrote about in "Preserving Our Cultural Heritage." The 23rd Southeast Asian Games will be held in the Philippines this year. Different sports will be hosted by cities all over the country, but most of the events will be held in Metro Manila. The website, however, seems to be geographically-challenged. Could Laguna really be in Metro Manila? In addition, clicking on the names of cities and or provinces on the venues page will lead to photos of the venues. Maybe some people will find the photos useful, but I think maps would have been more helpful. Minor quibbles, as usual, so don't mind me. Go team, go!!! Harry Potter and the Goblet of Fire has not started its regular run in the United States, but today was its first day in the Philippines. The movie is definitely not the book. The makers have added a few things that were not in the book, and dropped a lot of things that were in the book. But overall, it's a good movie worth seeing (as opposed to a good movie that's not worth seeing). Everything whizzes by so fast that those who haven't read the book will probably miss a lot. And those who've read the book... will also miss a lot. Do libraries need to be buildings that hold thousands of books? Should librarians know how the Internet works? In "Online libraries" (Philippine Daily Inquirer, 16 November 2005), Michael Tan seems to take these questions for granted. Instead, he writes about the Chan Robles Virtual Law Library and Project Gutenberg—both of which have been featured in "Filipiniana Online"—and other sites that I've been planning to feature. Tan mentions the University of the Philippines' subscriptions to electronic databases (erroneously identified on UP's website as "Electronic Journals") like Proquest, but misses the Philippine eLib, which allows students in other public universities to access electronic databases. 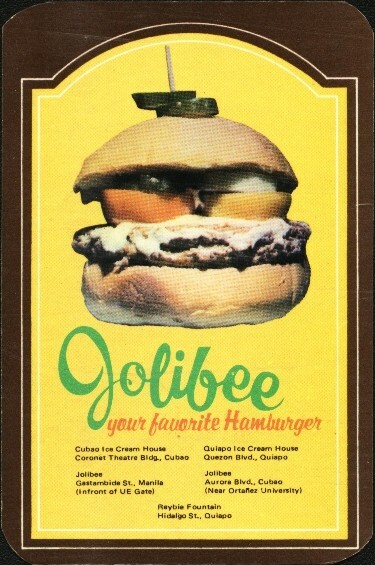 Perhaps those behind the Philippine eLib need to promote their product more. I still like the feel of an old-fashioned book, where you get to flip the pages with your fingers, but I don't mind reading an electronic version, especially if it's free. It's an exciting world out there, and the Internet's going to make it so much easier for us to explore it. My cellular phone is being repaired. Unfortunately, there are no Internet cafes for cellphones. So please email me if you need to get in touch with me. The bigger problem is that I didn't back up the numbers, birthdays and reminders on my phone. If my phone needs to be reprogrammed, then this librarian—who should've known better—only has himself to blame. "Most Caloocan residents... did not know the city had a library." The sentence above is from "Caloocan City gives reading habit a boost" by Nancy C. Carvajal (Philippine Daily Inquirer, 11 November 2005), but I would be willing to guess that many—if not most—Filipinos are not aware that their province, city or municipality has a library. A friend once told me that she went to a bookstore to do some research for her child. There's something wrong of course when a mother does her child's work, but why did she have to go to a bookstore? Kudos, of course, to Caloocan City for caring enough about literacy to promote its library, but forgive me for asking my usual question: Where's the librarian? I'm rather busy at the moment, but don't worry, the follow-up to "Are Bookstores Better Than Libraries?" is coming. And I'll definitely be posting about "Invisible Librarians" as soon as I can find the time. Sixteen paintings by Filipino and Mexican artists will be auctioned through eBay by the Cemex Philippines Foundation to "help schools get better facilities and offer students wider access to learning opportunities" (from the ad that appeared in Philippine Daily Inquirer, page A8, 11 November 2005). Click on the painting above to see all 16 paintings. Starting bids range from 65,000 pesos to 1.8 million pesos (Bencab's painting above). 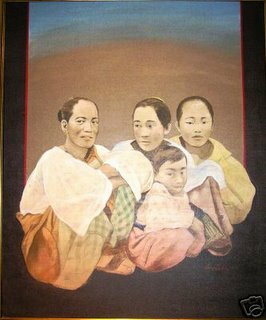 There are also two paintings by Malang. Time left to bid, at this time, is 1 day and 3 hours. But there must be something wrong because the ad only appeared in the newspaper today and no bids have been placed. 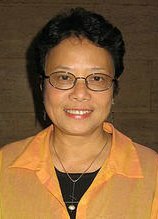 Grace Avellana Villamora is a Filipina information professional. In "Proudly Filipino," I promised to write about her because she is someone Filipinos can be proud of. Villamora is the author of Super Searchers on Madison Avenue (Medford, NJ: CyberAge Books/Information Today, 2003), for which she interviewed advertising librarians, market research consultants, and other advertising professionals across the United States. The book's bibliography is available online. You may wish to read the review by Chris Sherman of Search Engine Watch. Before becoming an information professional, she worked in advertising agencies in Manila and Chicago, and that's why she has had experience in advertising, public relations and market research. She is currently the principal of brightresearch llc, which provides just-in-time research on just about any business topic. Villamora has been an active member of the Special Libraries Association (SLA) since 1977, even though she is not a trained librarian, and has taken on many roles including that of speaker (2004) and moderator (2005) at annual conferences. She is probably the best-known Filipina in SLA today. When I saw "Bibles nurture hopes of poor" by Blanche S. Rivera (Philippine Daily Inquirer, 7 November 2005), I noted that it seemed as if the Bibles being distributed were how-to books that did not need to be interpreted at all. But I didn't think of the article again until I happened to open an old file that I had hoped to publish after further polishing. After looking at it again, I thought of sharing it here because if you look beyond the religious aspect, what it says about books that go unread and how students should be introduced to reading is also very relevant to the GMA Modular Library program and DepEd's Library Hub. I am writing this hoping that someone will be so incensed after reading it that s/he will want to prove me wrong. And whether I am proven right or wrong, I would be satisfied with having played a role in determining where the Catholic Church in the Philippines is now in terms of understanding the Bible. The Philippines is a predominantly Catholic country and I suspect that the average Catholic family has at least one Bible. But, if asked, only the mother would know where to find the Bible. Or, at best, one of the children would be able to pull it out right away but that would be because s/he has to bring it to school every day. Pathetic, right? It gets worse. Guess how many in this hypothetical average Catholic family actually read the Bible regularly? Most probably, none. Not even yearly, monthly, or weekly. And definitely, not daily. That's just reading. How about understanding? Never mind. But they hear the Word of God every Sunday, right? Then the priest explains, shouldn't that be enough? Umm, ALL of them? EVERY Sunday? And assuming they're all there every Sunday, do you think they actually HEAR what's read? The priest is a different story altogether. Let's not go there, let's stick to the Bible. Now that we've established (I know, I know...) that the average Catholic does not read the Bible (priests, religious and students at theological schools please lower your eyebrows, you are NOT average Catholics), let's try to imagine how "good" average Catholics live their faith. The "good" average Catholic would probably go to at least one Mass other than the Sunday Mass, say a novena once a month, say the rosary at least once a week, and remember to pray every day. She, however, would be hard-pressed to explain why we celebrate Christmas on December 25 when Jesus was born during a time when today's calendar did not yet exist. What about the "bad" ones? The "bad" average Catholic would probably go to Mass once in a while and remember to pray when he's in trouble. He also wouldn't know the difference between the Annunciation and the Immaculate Conception, the Assumption and the Ascension, and would probably agree if told that Catholics worship Mary as if she's God. I exaggerate, of course, but I doubt I would be very wrong. I have no empirical data but ask yourself if I have not been, in fact, describing someone you know. I taught religion during the past school year at a school with a devotion to the Sacred Heart. But most of my students, like me, would not be able to explain the significance of the devotions to the Sacred Heart of Jesus and to the Immaculate Heart of Mary. They had been required previously to bring their Bibles but eventually they learned to resent this requirement because they kept bringing their Bible but it was never used. What most Catholics in the Philippines have, in my scientifically-unsupported opinion, is a faith in a memorized Jesus and an adherence to devotions not fully understood. What we have is a faith based more on teachings that tell us what we can and cannot do aside from what we should and should not do. Why? Because religion teachers find it easier to ask their students to memorize the names of the twelve apostles than to challenge them to reflect on how they are similar to the apostles. Why? Because that's how they were taught by their own teachers. So, is it the teachers' fault? Not entirely. When I started teaching, I stated my objectives in terms of "X marks the spot." I told my 2nd year high school students that we had to be clear on where we wanted to go during the school year otherwise we would never get there. Or, alternatively, we would never find the hidden treasure if we had no idea where it was. And in this case, "X" was spelled "EKKS." E for Experience of God's love, KK for Knowing and Keeping the Word, and S for Spreading the Word. My guess was that most of them had been taught to KEEP the Word and not much more than that. I explained that I wanted to help them reflect on their own experience of God's love. Why? Because this is what will give them the reason to WANT to keep the Word. However, keeping the Word presumes that they KNOW the Word. And if their experience of God's love is strong enough, they will not want to just keep the Word but SPREAD the Word, as well. That's what happened to the first disciples, why should we be different? Without the first disciples' Experience of Jesus, they would not have had the courage to Keep the Word in the face of difficulties, nor the zeal to Spread the Word. EKKS marks the spot. Then I brought in the EKKS-Men who were different from everybody else and that's why people wanted to kill them even though they actually did a lot of good. I'm not talking of mutants but the followers of Christ. And how about the EKKS-files? The truth is NOT out there, it's in the Bible. That's why we need to read it. EKKSmas? Our Christmases would probably be more meaningful if we reflected on our Experience of God's love, whether we Know AND Keep the Word, and what our role has been in Spreading the Word in word and in deed. Funny? Simplistic? Well, it worked. At the end of the year, most of my students could understand and relate a given Bible-reading to their own experience of God's love AND spread the Word to a younger cousin in language that their cousins could understand. It did not go as smoothly as I have described it and it's very likely that a lot of them still hold very heretical ideas to be true but I console myself with the thought that if all I was able to do was get them to open the Bible and read it, then maybe I would have accomplished something. P.S. To see examples of how I taught, read "Introducing Gen X to the Bible." And then look at this Friendster testimonial, which let me know that I was able to accomplish a little of what I hoped to achieve. Results for the Librarians' Licensure Examination given last week have been released. Congratulations to the 240 new librarians! The entire list has been uploaded as a pdf file at INQ7.net (see "Exam Results" on the lower right-hand side of the webpage) and a short article that mentions the top performing schools and the top 10 examinees appears in Manila Bulletin. I have decided to update that post so that there will just be one page for Filipino online journals. Thanks to Mila Ramos for letting me know about International Rice Research Notes. In "Library Hub," I mentioned that there might be problems in continuing the DepEd project now that Miguel Luz, its chief proponent, is not with DepEd anymore. An article in Philippine Star gives some hope when it indicates that Ralph Recto, a senator, is supporting the creation of library hubs all over the country. The word "librarian," unsurprisingly, does not appear anywhere in the article. The link to the article is provided below, but since Philippine Star links "die" very quickly, I have also copied the full text so that others can still read the article when the link dies. "3 in 4 recent elementary grad [sic] can’t read"
Because three in every four recent elementary school graduates cannot read without help, the Department of Education (DepEd) is to set up book depots named after the country’s writers to instill a culture of reading among the young. Sen. Ralph Recto said the government through DepEd will set up 60 "library hubs" and 12 regional education learning centers next year. Recto, vice chairman of the Senate committee on finance, said the library hubs will be like "book depots" that will serve surrounding schools. He said the government will spend P120 million to build the first batch of these "textbook centrals and reading malls." Based on the DepEd briefer on the project which was submitted to the Senate, each hub will contain an initial 50,000 books. They will serve as "wholesome libraries that will lend books by the hundreds to elementary schools to promote in-school reading program," the DepEd said. To augment each library’s inventory, government is encouraging the private sector to donate books and to defray the cost of running it. "Donations are of course tax deductible," Recto said. A regional education learning center of RELC, on the other hand, will serve as "a regional base for in-service training and the development of indigenous instructional materials." "They’ll serve as workshops for the creation of books that serve local needs," Recto explained. He said the government plans to build 300 library hubs in the next few years. He has proposed that each library be named after a deceased local writer, to honor his work and to make him a model for the young. "For example, the one in Manila can be named after Nick Joaquin, and in Quezon City, after Franz Arcellana. If one will be put up in Pangasinan, it can be called the Carlos Bulosan Library. The Davao hub can be in honor of Alfrredo Navarro Salanga. Pateros children may soon be borrowing books from the Eman Lacaba public library," Recto said. "The list is endless. The best way to honor our writers is to name after them places where children go to read," he added. The DepEd recently partnered with Dole Asia Ltd. to institute the Library Hub Project inDavao City. Dole official John Dioquino pledged P2 million in support of the DepEd’s "Every Child a Reader by Grade 3" program. Under the agreement, DepEd launched the Library Hub Project to bring books to public schools nationwide and make every Filipino child a reader. Warehouse libraries with an adequate number of storybooks and supplementary reading materials will be set up in over 180 school divisions nationwide within a period of five years. These wholesale libraries will be stocked with at least 10,000 to 25,000 books in smaller divisions, to as many 50,000 to 200,000 in larger divisions. Since the establishment of libraries in over 40,000 public schools is prohibitive in cost, the DepEd’s system-wide solution is to partner with local government units, non-government organizations, and private corporations such as Dole Asia, former undersecretary Juan Miguel Luz said. Thesaurus on Philippine Environment—the book compiled by Romeo A. Sebastian, a Filipino librarian, and which was launched last September—has been featured in "Thesaurus of Pinoy environmental terms" by Doris Gaskell Nuyda (Philippine Daily Inquirer, 6 November 2005). In the process of illustrating how the thesaurus may be used, Nuyda gives an overview of how classification tools are constructed. LIS practitioners and students should be able to easily recognize Nuyda's references to BT, NT, RT, etc. I don't think anything like this has ever appeared in a newspaper column since I started blogging. But the most encouraging aspect of the column was that a brief biography of Sebastian was included! Not only was Sebastian identified as a librarian, other details about where he works and how he came to compile thesauri are also mentioned. Today is the big day. Tomorrow, too. Please remember those taking the exam in your prayers. It was particularly difficult last year when we had no electricity for most of the two-day exam. If the venue is still the same, I hope that contingency plans have at least been prepared so that examinees will have an easier time. "Hub of young readers" by Neni Sta. Romana-Cruz (Philippine Daily Inquirer, 31 October 2005) is proof that the Department of Education's Library Hub (pdf) is finally taking off. If FedEx can utilize the hub-and-spoke system to ensure the timely delivery of packages around the world, then surely DepEd can implement a similar system to ensure that public schools that can't afford to set up their own libraries have a means to "borrow" books for their students. This, however, is not as easy as it sounds. Politics, of course, just reared its ugly head... as usual. Undersecretary Miguel Luz, the proponent of the project, is currently in career limbo due to the President's unspecified dissatisfaction with his performance. While the article states that Luz has "given word that the Library Hub should continue," it is a reality that budgets tend to get frozen and supporters become uncooperative once project sponsors lose favor with the higher-ups. I hope this does not happen to the Library Hub. On a lesser note, I'm just wondering why librarians don't seem to have a role in the training sessions that have been conducted. Could it be that librarians really have nothing to contribute to the participants' understanding of the Library Hub? But don't mind me. Let's just pray that this project takes off beyond the pilot hubs.